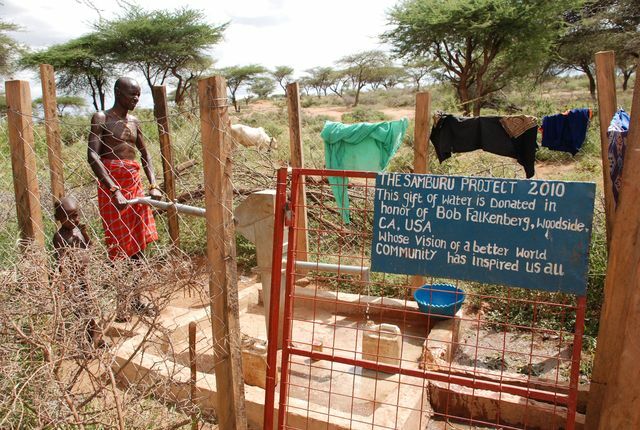 Funded by Bob Falkenberg, The Samburu Project drilled and installed a shallow well equipped with a handpump in this community. The water was 6 km downstream or 4 km to another well. 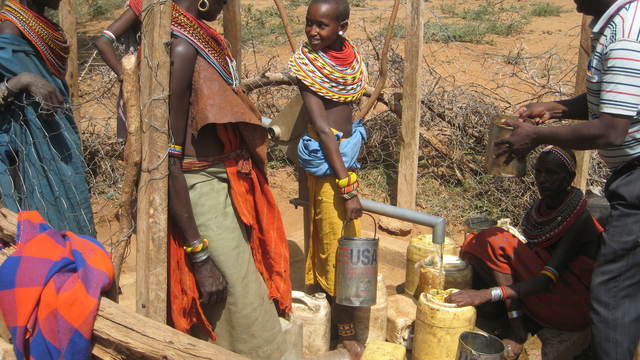 The newly installed well is within the community and requires only 30 minutes to get water. In the past they had to fetch water twice a day. Water from digging in the riverbed only lasts one month per year and it is dirty whereas well water is clean. Previously it took so long to get the livestock to water that they didn't have time to graze; now the animals are able to feed. The well provides the community with security. They know that during a drought the well won't get dry and even when it floods the water is dirty and they know that they can get clean water from the well. One woman said she used to wake up and walk the whole day for water and return late at night and it hurt her physically to carry the water. 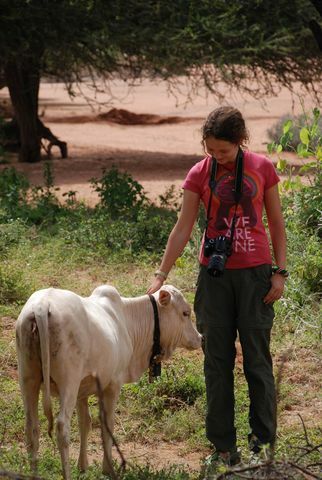 In her extra time she looks after her children, tend to her livestock, spend time with her family, and engage in micro-enterprise, creating and selling handicrafts and beads. Selling beads gives her spending power within her familiy, something she didn't have before the well. 1. Some members of the community still have to walk 7km to get water. But before the well was drilled, family members would take turns walking all day with a donkey for water. 2. Because of well, children congregate. 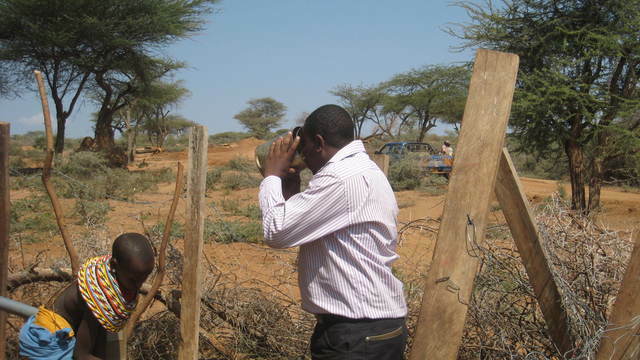 Kenyan government saw this during one their visits and decided to build a school near the well. The structure is complete and the chalkboards have been installed. However, there are still some finishing touches needed. Planned opening date - January 2013. 3. Well works, but it takes 10 pumps for water to come. 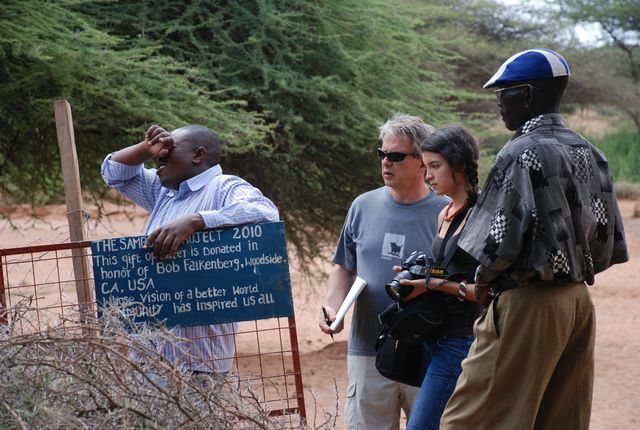 Samburu project will deliver rubber to address. 4. Rocks that once surrounded the well were shifted by the recent floods. Community plans to rearrange the rocks and reinforce. 5. Well has good flow – up to 3 cubic meters/hour. 6. As a result, community wants to add a solar-powered pump to run water to top of hill (where the new school is located) and to the hill on the opposite hill. The estimated cost to make these changes is US$5000 to US$6000. 7. As a separate project, the community also wants to build another structure near the school to serve as a kitchen. We originally visited the well on Wednesday, May 16 late in the afternoon. We arrived at the well to find a man sitting nearby at the edge of the dry riverbed but he was not part of this community. Thankfully, Paul, the person in charge of well maintenance, was accompanying us to our well visits and reported that there was a big flood recently that swept through this area and actually covered the entire well with several feet of sand. The community had to scoop out all of the sand from this well (you can still see some of the sand on the slab) in order to use it again. I asked Paul whether the sand contaminated the water and he said that after pumping the water for a while, the water began coming out clean and there was no contamination. 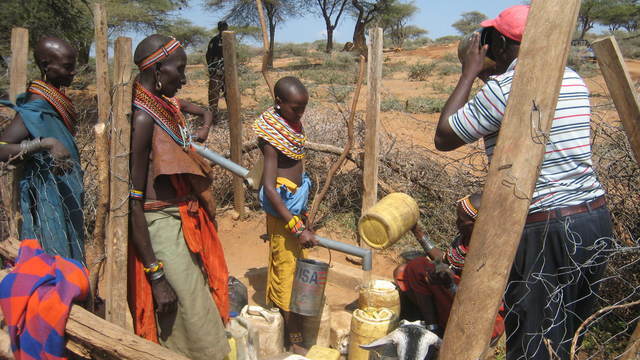 A Samburu mama and her child came by the well and though she wasn’t in any spirits to answer our questions she did confirm that there has been no problem with the well. Having forgotten to take coordinates during that visit, we made a second trip to the well on Monday May 21 which turned out to be a great decision! Unlike the first time, there were a couple of women and several children taking water from the well when we stopped by this second time. The women confirmed what Paul had reported a few days prior – there was a very powerful flood that came through this area and actually uprooted and destroyed a very big tree right next to the well. They also confirmed that the well was not permanently contaminated and it is working perfectly well now; I saw with my own eyes that the water being pumped from this well was indeed clean. Lucas spent a long time talking to the women and advising them on how to protect the well from future flooding. He instructed the community to dig deep trenches so that the rain water can be funneled and diverted away from the well; the women agreed to pass along this idea to the elders but noted that the flood is now coming from many different directions and that due to the ever-changing course of the river, the well is now basically in the middle of the river’s path. To date, this well has been affected one way or another by three floods. He suspects that if no permanent barrier or solution is established that this well will in a few years’ time no longer be functioning. We are currently looking into different long term solution to prevent further destruction to this well. After a long day in the field conducting hydrogeologic surveys and finding two new sites in Lauragi and Soit Elotimi , Kariuki and Lucas stopped by this well to quench their thirst. See pictures. 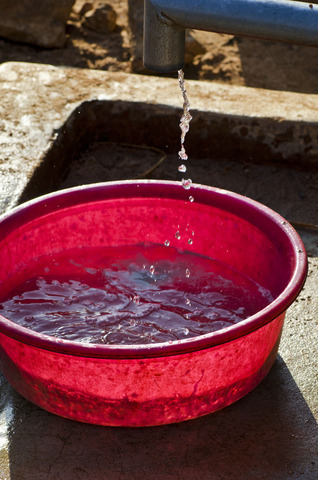 -A community member stated they "cannot imagine life without the well" and "even if it broke for a day there would be many problems"
Water from digging in the riverbed only lasts one month per year and it is dirty, whereas this water is clean and lasts all year. Previously it took so long to get the livestock to water that they didn't have time graze; now the animals are able to feed. 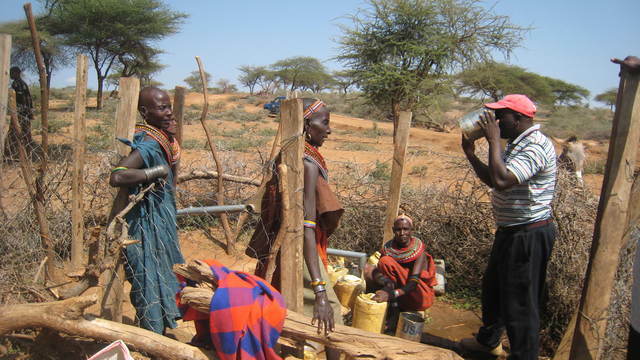 The well provides the community with security against drought. They know that during a drought the well will not dry out, and even when it floods and the water is dirty they know that they can get clean water from the well.